Kurigram, Dec 9 (Just News): BNP senior joint secretary general Ruhul Kabir Rizvi on Saturday alleged that the ruling Awami League government starts the culture of disappearances and killings whenever they come to power. The BNP leader made the deep sigh as they failed to observe the Begum Rokeya Day because of lack of permission from police department. “The incumbent government has no accountability to society as they were not elected by vote. So they are conducting politics of attacks and arrests,” he continued. BNP will form human chains marking the International Human Rights Day across the country on December 10, he told the journalists. 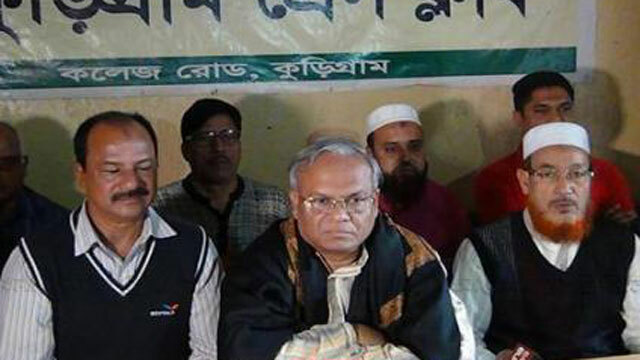 BNP senior vice-president of district unit Abu Bakar Siddique, joint general secretary of Sohel Hossain Kaikobad, Juba Dal president Aminul Ahsan were also present, among others.